Germany’s Federal Transport Minister Andreas Scheuer earlier this month presented funding guidelines for subsidies for energy-efficient, low-carbon trucks using Compressed (CNG) and Liquefied Natural Gas (LNG). Transport companies are now awaiting notice about commencement from the Federal Office for Freight Transport (BAG) as fund manager, expected mid-July. Strong interest is anticipated. a company that is a future holder or owner of at least one heavy commercial vehicle approved in the Federal Republic of Germany for use on public roads, with a propulsion type within the meaning of the “EEN” * Directive . Eligibility is only given if the application for subsidy has been submitted before a binding obligation to purchase the vehicle (binding order, conclusion of the purchase contract or leasing contract). “We want to help forwarders to switch to environmentally friendly trucks. Everyone benefits from the change – the freight forwarders, the environment and the residents of particularly polluted roads,” said Andreas Scheuer. whose permissible total weight is at least 7.5 tonnes. The vehicles must be offered for sale as a standard new vehicle in an EU Member State. They must also go beyond the level of environmental protection prescribed by the Union standards at the time of purchase, or, in the absence of such standards, improve environmental protection. The amount of subsidy per lorry and tractor is EUR 8,000 for CNG and EUR 12,000 for LNG. The subsidy is limited to EUR 500,000 per company. Vehicles for which a donation has been granted must remain registered with the beneficiary for at least four consecutive years in the Federal Republic of Germany. In 2018 alone, 10 million euros will be available for the funding program. The funding program will run until the end of 2020 but there is a possibility of extension. The new subsidy scheme significantly reduces the investment increment for natural gas fuelled heavy duty trucks and consequently offers a dramatic reduction for return on investment. Furthermore, the scheme signifies that for Germany, natural gas is now firmly accepted as a suitable replacement for diesel for the freight sector. There are about 900 CNG stations across the country and LNG station development is underway. 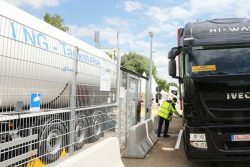 Germany’s first LNG station for trucks was opened in 2016, at Ulm, and Berlin-based Liquind 24/7 GmbH is starting construction of ten other LNG locations supported by the EU Commission’s Connecting Europe Facility (CEF). Furthermore, the announcement follows two recent developments, one being the closure of the EU’s Blue Corridor Project which did much to elevate the awareness of natural gas fuel throughout Europe, and the other being the introduction of long distance high-powered natural gas fuelled trucks from Volvo, IVECO, and Scania over the last two years. The volume of gas sold is expected to grow as new trucks are commissioned, adding strength and security for the European gas market.